Today in 1960 the Houston Post reports Jerry Crew's initial attempt to record the size and shape of the tracks he was finding. He traced the large track on paper and took it to a taxidermist named Bob Titmus. Although reported in 1960, the actual meeting between Mr. Crew and Mr. Titmus happened much earlier, it had to have happened before October 3, 1958. This was the date when Jerry Crew made the 16 inch cast shown in the photograph above. Jerry Crew was a tractor operator on a road construction site in woods of Northern California. One day he found large 16 inch tracks that circled around his Caterpillar tractor. 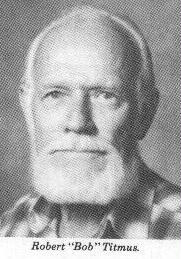 Bob Titmus was described by John Green in a eulogy as, "a key figure in Sasquatch/Bigfoot investigation for almost 40 years." Mr. Titmus, a taxidermist, happened to be a friend and nearby when Jerry Crew found the tracks. 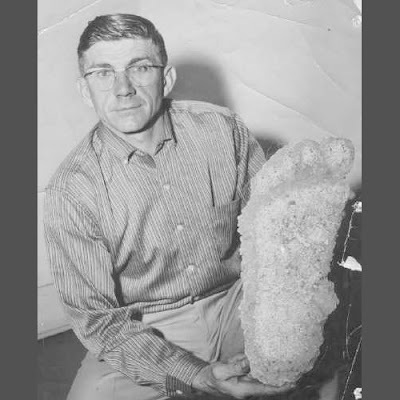 According to Joshua Blu Bluhs book, Bigfoot: The Life and Times of a Legend, "Titmus remembered the meeting decades later, he told Crew that the trace [on paper] lacked too much detail and taught him how to make a plaster cast. Later, Crew called Titmus and said he made a cast. it was sixteen inches long." The story that Bob Titmus provided the plaster and taught Jerry Crew has been repeated by multiple sources, from a eulogy written by John Green to an interview with Bob Titmus in an ISC newsletter. Thanks for another bit of Bigfoot history it never gets boring. Thanks Lee, I got a whole year of these!